The author collates the eloquent rhetoric and caustic debates between expansionist members of Congress, including alpha male Theodore Roosevelt, aristocrat Henry Cabot Lodge, media giant William Randolph Hearst and prominent anti-empire social critics and populist orators, including Mark Twain, William Jennings Bryan and steel magnate and philanthropist Andrew Carnegie to capture vividly the divided political passions and high stakes of the day. The Spanish-American War of 1898 was the spark that inflamed the U.S. quest for overseas colonies. It began with Cuba and quickly moved to claim Puerto Rico, then the Philippines, Guam (seized en route to the Philippines) and Hawaii—all in nine months. In public, expansionists framed these takeovers as beneficent: rescuing oppressed and backward people to catechize and civilize them. Independence movements in Cuba, the Philippines and Hawaii were brutally suppressed. Hundreds of thousands of people were killed, particularly in the Philippines, which waged guerrilla warfare until defeated in 1902. While American soldiers tortured and assassinated prisoners, burned villages and killed farm animals (a precursor to the later American War in Vietnam), a pliant press followed military orders and carried no unfavorable coverage. Kinzer’s considerable talent joins meticulous research and engaging stories with a canine ability to sniff out the lies beneath the platitudes that sold the public on war. What he foregrounds so credibly are the oversized male egos of “large policy” politicians with more morally grounded and prescient anti-imperialist crusaders. Among these are Booker T. Washington, who, in speaking against U.S. imperialism abroad, warned that the cancer in our midst—racism, the legacy of slavery—will prove to be as dangerous to the country’s well-being as an attack from without. Many African-American anti-imperialist groups emerged and assailed U.S. imperialism for its intrinsic white racist arrogance. The final chapter, “The Deep Hurt,” traces the arc of U.S. militarism across the 20th century and into the 21st—a long and unfinished arc that is neither moral nor bends toward justice. 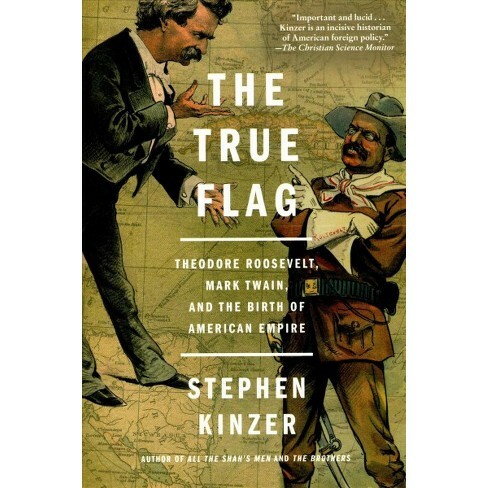 At each end of this ongoing arc, the words of two military veterans of U.S. foreign wars distill and corroborate Kinzer’s stateside exposé in “The True Flag.” Brigadier General Smedley Butler, born in 1881, began his career as a teenage Marine combat soldier assigned to Cuba and Puerto Rico during the U.S. invasion of those islands. He fought next in the U.S. war in the Philippines, ostensibly against Spanish imperialism but ultimately against the Philippine revolution for independence. Next he was assigned to fight against China during the Boxer Rebellion and was also stationed in Guam. He gained the highest rank and a host of medals during subsequent U.S. occupations and military interventions in Central America and the Caribbean, popularly known as the Banana Wars. Making the world “safe for democracy” was, at its core, making the world safe for war profits. Of diplomacy Butler wrote, “The State Department … is always talking about peace but thinking about war.” He proposed an “Amendment for Peace”: In essence, keep military (Army, Navy, Air Force) on the continental U.S. for the purpose of defense against military invasions here. And in the 21st century, Major Danny Sjursen, who served tours with reconnaissance units in Iraq and Afghanistan, proposes that the Department of Defense should be renamed the Department of Offense. His reasons: American troops are deployed in 70 percent of the world’s countries; American pilots are currently bombing seven countries; and the U.S., alone among nations, has divided the six inhabited continents into six military commands. Our military operations exceed U.S. national interests and are “unmoored” from reasoned strategy and our society’s needs, Sjursen concludes. First published in Truthdig; reprinted with author’s permission. Pat Hynes, a retired Professor of Environmental Health from Boston University School of Public Health, directs the Traprock Center for Peace and Justice http://traprock.org.